Making radio and listening to radio, garden work and garden recreation – what is the outcome of a combination of these components in “radio gardening”? Datscha Radio17, a temporary radio station, is dedicated to this question. 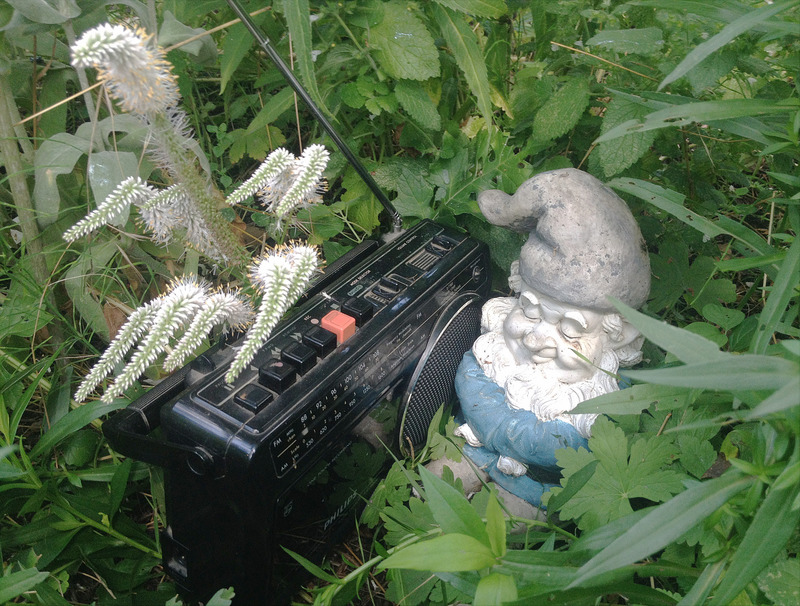 In the summer of 2017, it re-flourished for five days at the edge of Berlin and one thing became clear: the powerful symbiosis went beyond the constraints of both radio and garden. One did not find a sound-proofed broadcasting studio in a magnificent building guarded by a janitor, but a cozy datscha that opened its mic not only for invited guests, but also for surprise visitors; besides international sound artists and neighbours from the garden colony, there were also the song-loving birds of the area, and occasionally even plants. Because potatoes and peonies can express themselves, too. Not via spoken word, but via other electric or fragrant ways. Alternative communications. All these wondrous discoveries remind one slightly of the ‘Perinphon’ networks from Dietmar Dath’s science-fiction novel The Abolition of Species, in which the descendants of humans keep themselves updated via an information system that is based on especially designed scent molecules. In Dath’s novel, the gente can simply smell what’s going on. The plant world of today has already attained this science-fiction! Could we also see Datscha Radio17 as a futurististic translation machine for communication with the plant world that is way ahead of its time, way ahead of a breakthrough into the mainstream of its time? Why not! Communication was an important keyword for the entire Datscha Radio 17. It was not just about making as many people as possible interested in its programme, but also the communicative interaction with its audience, as well as with its location; the biotope of the garden played a major role. What is the societal role of the garden today, and what might it be in the future, was also vigorously debated in various discussion rounds. But also as an acoustic gallery, Datscha Radio17 cut a grand figure. Whoever came out to visit the open garden society could listen to poetry readings under the honey yellow moon, witness live concerts with the accompaniment of crickets, or soak up the variety of guest contributions that arrived from almost all around the globe with a glass of apple cider. In conclusion: The concept of “Radio gardening” is convincing. The garden is transformed from a sealed off plot, where a sole ruler decides over the weal and woe of the plants, to a real place of encounter for a diversity of life forms. Such a policy of open borders is an effectively lived utopia in times of increasing tendencies to compartmentalise, and a real ray of hope. And radio is transformed from a one way medium to a media platform that is shaped by participation. With Datscha Radio17, even the listening itself does not happen like usual wireless consumption – only at the breakfast table inside one’s own four walls or in the car, that is, either alone or with the familiar yet closed company of family, friends or acquaintances – the garden-based listening groups that came together in various locations were exemplary of that. Only a drop of bitterness remains: the short flowering duration of the five day Datscha Radio17. But just like a herbaceous perennial that hibernates after blossoming, Datscha Radio17 will surely reflourish in one of the coming summers and, like a rare plant, will enlighten the radio landscape again.